Hoonistan: Toyota is the freak of motor sport. The Toyota Hilux has won wars over legitimate armies by illegitimate and unrecognized armies or rebels as you may call. Welcome to Aouzou Strip, this connects Chad to Libya and Libya to Chad, which also makes them neighbors. But highly volatile neighbors found poking in each others territory for no apparent reason. Chadian soldiers in Toyota 70 Series flatbed. In 1986, When Libyan President Muammar Al-Gaddafi declined to accept the legitimacy of the Chadian President Hissenne Hebre. I mean let’s not be facetious, when you do not accept the presence of a President supported by army with Toyota trucks then all you get is the death toll of your soldiers. The war between Libya and Chad was also called “Toyota War”, in which Chad claimed victory over Libya’s well equipped army. The Chadian had only Toyotas used as technicals, equipped with RPG’s, Anti-aircraft guns along with 15-20 or even more men armed with AK-47s sitting on its flatbed ready for a rampage. A brief ‘Thank You’ letter was sent to Armées françaises from Chad however. But, everyone has friends or interests. So is there any other vehicle in the world which has a war named after it. You will find none, as nobody survived to tell the tale but Toyota had moments to cherish as they found a new horizon in potential markets; Taliban, Somalia, Al-Qaeda and many more recognized & non-recognized armies used Toyota pick-up. Pakistan Army has however begun to replace salvaged Toyotas with Mitsubishi L200, but even though the army has tagged them as salvage, people buy it and run it as if it were new. Even the CIA and U.S. Special forces have come to the conclusion that their HUMVEES just run the houses of workers and roll big bank accounts. Now, realized, the mobility competence of HUMVEES, the CIA and US Special Forces switched over to Toyota Tacoma which is the renamed version of Hilux produced in and for the USA. the US Special Forces soldiers in a Toyota Tacoma. Perhaps Seymore Hersh plans to eradicate the use of Toyotas by Taliban and equip them with American 4×4 trucks from Detroit and replace all the HUMVEES used by the US Military and provide them Toyotas so they can win the war on terror. So shall we now move on to the inspirational force which made the US Special Forces and CIA use the Toyotas. Well, meet Taliban; we all feel that these humans can’t be negotiated with, as a consequence everyone concludes that they can’t be taught as well, but the use of Toyota by the CIA and US Special Forces sure gave everyone a dose of reality that maybe, they can’t be taught or reasoned with, but they can, infact they did teach the intruders or aspirational?. 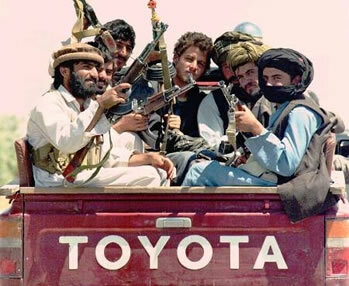 Taliban in a 5th Generation Toyota Hilux. It is not tough to find out what drives the infamous Taliban hooligans across the hostile terrain of South Waziristan, it’s the Toyota Hilux or Land Cruise BJ70(Flatbed/cabin both) incase you’re wondering. The Toyota’s were selected by the ISI to mobile the militiamen in Afghanistan to rise against the Russian invasion which led the Russians to retreat out of Afghanistan. The militiamen used the Toyotas as technical with similar equipment as the Chadian rebels. Many of these men even die in such assaults but the Toyota survives. “[Hakimullah Mehsud] was already famous within the Taliban for his skills in battle – his ability to handle a Kalashnikov and a Toyota pick-up were legendary. “He is the best after Nek Mohammad,” our Taliban driver told us during a hair-raising journey before the meeting in 2007”. “He took us for a drive. To demonstrate his skill with the vehicle, he drove like a man possessed, maneuvering around razor sharp bends at impossible speeds. He finished the demonstration by braking inches short of a several hundred foot drop. While the rest of us sat in stunned silence, he just laughed chillingly and stuck the car in reverse to smoothly continue the journey”. By feeling the words of Mr. Shoaib, I can tell that Hakimullah Mehsud did a moose test sorta thing on his Toyota, which is indeed quite terrifying experience in a car with such height and big tires. In October 2007, the Swedish car magazine Teknikens Värld performed an evasive maneuver (a moose test) that revealed that the Hilux pickup truck was less than ideal for turning abruptly at speed. The car failed the test and only the driver’s skill prevented it from overturning. After the test Toyota stopped the sales of Hilux equipped with 16 inch wheels in Europe. But come on, a vehicle that tall isn’t destined to do that at those speeds. I have only seen Saudi Shabab’s die doing that or if they survive, they simply come out of the car and put its feet back to ground and have another try. It is Jeann-claude Van Dam or Sunny Deol of the Motor World. If you ask me what King Leonidus from Spartan or Hercules from Greece or the green monster Hulk would drive to the battle-field today, the answer would certainly be a Toyota Hilux.